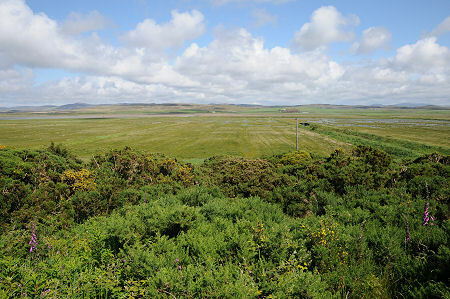 The north coast of Islay is little known and ranges from sparsely populated areas to completely uninhabited ones. The most striking geographical feature is Loch Gruinart, a shallow sea loch which takes a mile wide bite into the coastline and extends four miles inland, stopping less than 2½ miles short of linking with Loch Indaal and turning the north west of Islay into a separate island. Loch Gruinart provides a range of landscapes, from beaches of beautiful white sand and dunes at its mouth to saltmarsh, mudflats, and grassland at its head, surrounded by moorland and peat bog. The area around the head of the loch forms a 1,667 hectare nature reserve purchased by the RSPB in 1984. Loch Gruinart Nature Reserve provides a range of habitats of considerable importance to migrating and other birds, and to other wildlife ranging from 24 species of butterfly to otters, seals, hares and deer. In terms of birds, 45% of the entire global population of Greenland barnacle geese visit Loch Gruinart each winter, along with 4% of the world population of Greenland white fronted geese. As a result as many as 24,000 geese have been counted here at any one time. In addition 200 pairs of lapwings and 100 pairs of redshanks breed on the reserve, which is also a haven for corncrakes, choughs, hen harriers and a variety of wading birds, as well as more common species such as swallows: see image below right. 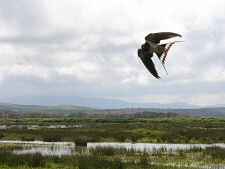 The focal point for the reserve is the visitor centre, which is open all year. This can be found as part of a complex of farm buildings just to the south of the junction between the single track B8017 just south west of the head of Loch Gruinart, and the minor road running up the loch's western shore. The car park is in the farmyard, and the visitor centre itself is on the south side. Inside you find a large attractive space offering background information about the reserve and about Loch Gruinart, together with a friendly welcome. 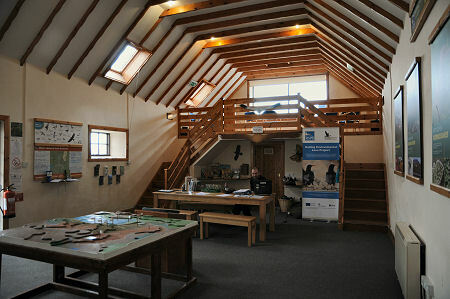 At one end of the visitor centre is an upper gallery with large windows offering great views out over the reserve. A quarter of a mile north of the visitor centre, along the minor road leading up the west side of the loch, is the hide car park (or you can leave your car at the visitor centre and walk). A gate in the fence on the east side of the road gives access to three elements of the reserve which allow you to come much closer to the birds and other wildlife. A short distance down a sloping track is a viewing platform that gives excellent views over the head of the loch and the surrounding landscape (see header picture). From here a path leads for 1.5km through the woods along this side of the valley before emerging back on the minor road. Alternatively you can follow the path that leads 300m to the reserve's hide. This leads down to the foot of the side of the valley, and then along a track out to the green wooden hide itself, the track being sunk into the surrounding landscape and banked on both sides to ensure those going to and from the hide do not create a disturbance. Accessibility of the different parts of the reserve is good. See the link on the right for detailed information, but it is possible for disabled visitors to drive to the hide itself. Inside the hide you find plenty of space for occupants to spread themselves out, and it offers superb views over the marshy land to the east and north. Islay is an island which from a visitor's point of view tends to revolve around its eight distilleries and, for those who look into it more deeply, a surprising number of old chapels and carved stones (as at Kilnave, on the western short of Loch Gruinart three miles north of the RSPB Visitor Centre). It is therefore good that the island can, thanks to the efforts of the RSPB, offer a very different sort of visitor experience, and a thoroughly enjoyable one, at the Loch Gruinart Nature Reserve. STB 3 Star Visitor Attraction.